Short of ideas for a story you’re writing? Does your brain feel like a sieve with all the ideas drained out? A Word Wall is used to help elementary children get ideas and learn words that are related to the main theme. It’s also known as a Word Bank. For instance, if children are learning about farm animals, the teacher posts a picture of a barn on a bulletin board. Then, she posts words underneath the picture such as cow, sheep, pig, hen, and duck. When children are writing and get stuck for ideas, they look at the word wall and choose words from the list that they want in their story. I like to make Word Walls, too! I figure, why let the kids have all the fun? We kitties like to have fun, too! Then, open up the file folder. On the inside write any word or phrase that comes to mind about the theme of your story or book. 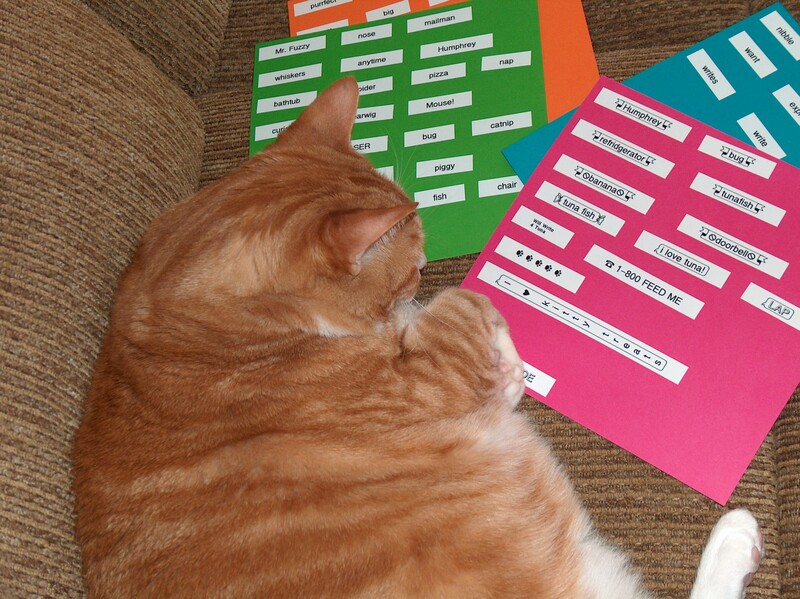 For example, my Word Wall about me includes the following words and phrases: purrfect, pawsitively, paws/pause, nine lives, cat-a-tonic, cat-alogue, tuna fish, etc. Keep adding to your Word Wall when you think of more words and phrases. Then, next time you sit down and get stuck writing, pull out that Word Wall and see how it helps jump-start your creativity! 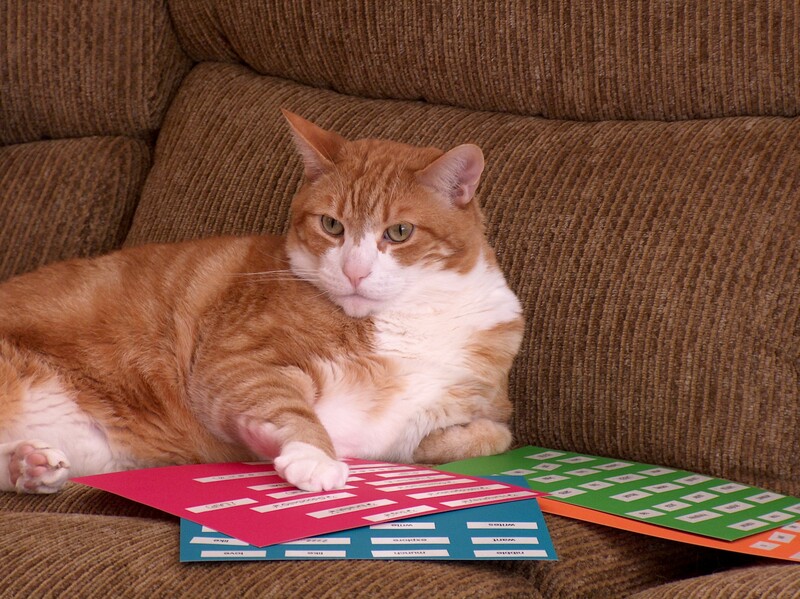 Here you can see me with a set of color-coded word walls I made. One color has nouns like tuna and fish. Another color has adjectives like tuna fish. Did I mention that tuna fish is my favorite word to write about? WriteShop Primary by Nancy I. Sanders is filled with games, crafts, and tools such as Portable Word Banks—fun activities that help you introduce important skills to your littlest writers. “Word Walls According to Humphrey” ©2011 Nancy I. Sanders. Used by permission. This is a fantastic pre-writing exercise. I use the same kind of thing with varying success. My students have responded fairly positively to producing cluster outlines – an old horse I know, but I can definitely see the comparison between the cluster and the wall. I will definitely give it a shot. 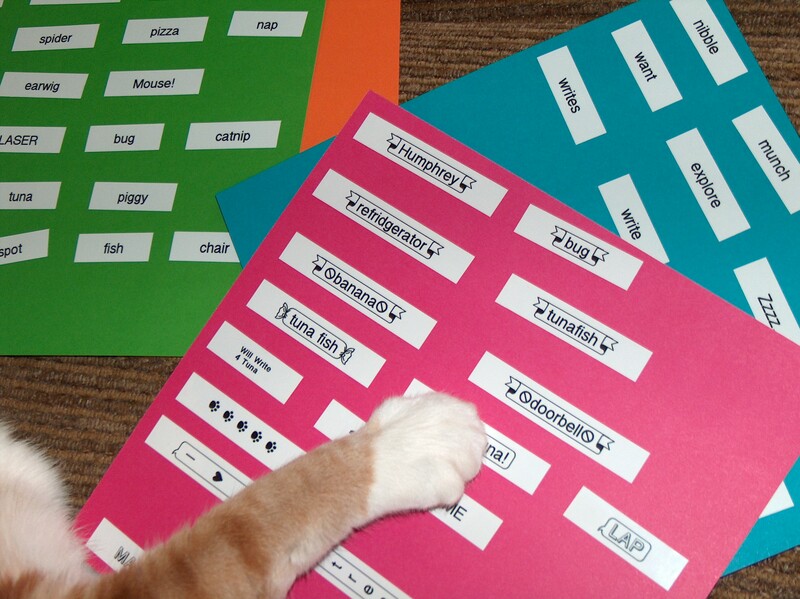 @Janet: What a fun idea for creating a thematic word bank! @Jacob: Who knew you could learn so much from a cat? 🙂 Thanks for visiting.